This post is part of the Sparkle Quilt Along. For more information see here. 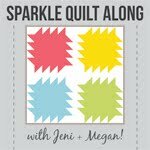 Welcome to the second week of the Sparkle Quilt Along, hosted by Megan of Canoe Ridge Creations and myself! Head on over to Megan's blog today for Week two: Cutting Instructions! Cutting!, a photo by jenib320 on Flickr. I finished up my cutting this morning! Getting excited to sew! Your fabric choices are just immaculate, they are going to make such a cute quilt!